If you want to live, you will obey. Executive Producer Steven Spielberg delivers the ultimate race-against-time thriller that will keep you on the edge of your seat! Shia LaBeouf and Michelle Monaghan star as strangers ripped from their ordinary lives when they are "activated" as part of a high-tech assassination plot. Through blistering chases and shocking twists they try to escape - but where do you go when the enemy is everywhere? $29.150 million on 3510 screens. Slowly but surely, Shia LaBeouf has turned into a solid box office draw. It’s no surprise he’s had hits with titles like Transformers and Indiana Jones and the Kingdom of the Crystal Skull; both were pre-sold to audiences, so LaBeouf’s presence didn’t seem to impact their success. However, LaBeouf has been able to lead projects to the top of the box office charts. He did this with 2007’s Disturbia and he accomplished it again with 2008’s action-thriller Eagle Eye. No, the latter’s $100 million gross didn’t set the world on fire, but it demonstrated that LaBeouf could “open” a movie and bring in a decent box office total. Reunited with Disturbia director DJ Caruso, Eagle Eye casts LaBeouf as Jerry Shaw, an ordinary – though smooth-talking - 20-something drone at Copy Cabana. His life gets a jolt when his twin brother Ethan dies and he briefly reunites with his estranged family. After the funeral, Jerry’s life takes a turn for the weird. Though perpetually broke, he suddenly finds hundreds of thousands of dollars in his bank account. He also finds boxes of military weapons and other items stashed in his apartment. A cryptic called tells him he’s been “activated” and warns him to immediately depart so he can avoid FBI incarceration. 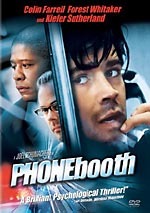 Jerry doesn’t listen, so he ends up under questioning from agent Tom Morgan (Billy Bob Thornton). However, the mysterious forces intervene and allow for his escape. We also meet Rachel Holloman (Michelle Monaghan), a single mother. After she sends her son Sam (Cameron Boyce) away on a school trip, she receives the same weird message about being “activated”. She gets guided to the wheel of a Porsche Cayenne, a vehicle into which the powers also place Jerry. This sends the pair on a shared journey to flee the various authorities, figure out what’s behind their adventures, and maybe even stay alive. Some movies require a little suspension of disbelief, while others demand a lot. Eye falls into the “hunka-buncha suspension required” category. Actually, I think one must put the logical side of your brain on hold for a movie like this than for something like Transformers because Eye tries to exist in the real world. Transformers never pretends to be anything other than straight fantasy, but Eye wants us to accept it as something that could occur in reality. In that manner, it fails. At no point does Eye seem particularly plausible, and it comes chock full of plot holes. It requires far too many coincidences and bits of magic to enter the realm of reality. Because we’re supposed to view it as part of the real world, its lack of believability causes it to lose some points. Eye also gets zapped a bit due to the manner in which it flaunts its influences. At times, the film feels like a conglomeration of ideas taken from other flicks. 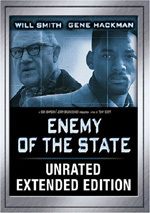 In particular, Enemy of the State comes as an obvious precursor, and I see bits of The Matrix, Hitchcock and other flicks as well. Originality never becomes one of the movie’s strongest points. But you know what? Eye entertains despite its flaws. While the story elements may seem derivative, the main plot itself keeps us involved. Caruso takes a potentially complicated tale and delivers it in a way that minimizes its messiness. With a mix of borderline extraneous characters and plot complications, the movie easily could – and probably should – have turned into a perpetually confusing, off-putting production. To my surprise, that never occurs. Instead, Caruso keeps things on point. Elements that could’ve been mystifying instead seem intriguing. The movie dollops out just enough plot elements to keep us interested. We always feel curious to see where the film will go next, but the film avoids the traps that might come with its often obtuse nature. LaBeouf’s natural charm continues to serve him well. Despite his youth, he manifests a nice “everyman” feel that makes him perfect for projects like this. In some ways, he often plays similar roles, but unlike someone such as Seth Rogen, LaBeouf doesn’t seem the same in his movies. Nothing here extends LaBeouf beyond the “ordinary guy in extraordinary circumstances” theme of many other characters, but he still manages to make Jerry seem three-dimensional and not like the same old thing. Caruso also handles the flick’s many action scenes well. I could live without his preference for hand-held camerawork; some dialogue scenes become irritating due to their intrusive use of shakycam. This doesn’t distract during the action sequences, though, and Caruso delivers a lot of rousing set pieces. Those add real pep to the production and allow us to ignore some of the film’s flaws. And make no mistake: Eagle Eye comes with its share of problems, some avoidable, some probably not. Nonetheless, it packs enough excitement and entertainment to usually overcome its problems. It turns into a consistently fun and enjoyable experience. 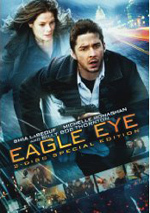 Eagle Eye appears in an aspect ratio of approximately 2.35:1 on this single-sided, double-layered DVD; the image has been enhanced for 16X9 televisions. No significant issues materialized during this fine presentation. Sharpness always looked quite good. From start to finish, the movie seemed concise and accurate, with few signs of softness on display. Jagged edges and shimmering were absent, but some slight edge haloes appeared. In addition, source flaws failed to occur. Much of the time the palette of Eagle Eye went with stylized hues. It often went with cold blues for the military pieces and had a desaturated golden look for a lot of the other bits. Across the board, the colors fit with the design and came across well. Blacks seemed deep and firm, while shadows showed good clarity and delineation. This was a consistently positive transfer that narrowly fell below “A” level. With all its action scenes, the Dolby Digital 5.1 soundtrack of Eagle Eye boasted many opportunities to shine. It took advantage of these to create a vibrant soundfield. You name an action element and it likely appeared here: gunfire, trains, car chases, helicopters, missile launches, and plenty of other exciting pieces cropped up often throughout the movie. The track managed to mesh the elements well and made this an involving setting. That meant plenty of surround usage. The back speakers became nearly equal partners, as they provided tons of unique information. The whole package blended smoothly and created a consistently lively sense of place and action. In addition, the movie offered excellent audio quality. Speech sounded natural and concise; I noticed no edginess or other distractions. Music took a backseat to the effects, but the score was vivid and full. As expected, effects played the most important role here. Those elements appeared vibrant and accurate. They showed clean reproduction and packed a good punch; low-end response made fine use of the subwoofer. All in all, the movie featured a terrific soundtrack. We find a mix of extras spread across this two-DVD release. Most of the supplements appear on the second platter. On DVD One, we find a three-minute and four-second featurette called Road Trip: On Location with the Cast and Crew provides comments from director DJ Caruso, producers Alex Kurtzman and Roberto Orci, production designer Tom Sanders, and actors Shia LaBeouf and Michelle Monaghan. They tell us that they visited a bunch of sets and things moved quickly. We get a few other very minor production notes, but there’s very little substance here. We see a couple of mildly interesting shots from the set, but this is nothing more than an advertisement. Three Deleted Scenes run a total of three minutes, 35 seconds. These include “Ethan’s Wake” (0:36), “Minuteman” (1:13) and “Twins” (1:46). “Wake” offers a longer glimpse of Jerry’s estranged relationship with his family, while “Minuteman” gives us a bit more exposition in terms of plot complexities and some characters. “Twins” fleshes out Jerry’s relationship with his brother a wee bit more as well, though it simply extends an existing scene. None of these seem particularly interesting. “Minuteman” probably appears the most useful, as it gives us decent details. However, it’s unnecessary, and in the context of the full film, I expect it’d slow down the drama. All of these cuts were good ones. DVD One opens with a few ads. We get promos for The Uninvited, Tropic Thunder, Ghost Town, and Without a Paddle: Nature’s Calling. These also appear in the Previews area along with clips for The Duchess, The Godfather Trilogy Restored and Van Wilder: Freshman Year. Over on DVD Two, we open with an alternate ending. It goes for one minutes, seven seconds. This scene gives the movie an opening for a sequel – a really, really stupid opening for a sequel. I’m quite glad it got the boot. Four featurettes follow. Asymmetrical Warfare: The Making of Eagle Eye runs 25 minutes, 30 seconds and includes Kurtzman, Orci, Caruso, LaBeouf, Sanders, Monaghan, director of photography Darius Wolski, 2nd unit director Brian Smrz, and special effects coordinator Peter Chesney. The show covers the movie’s development, cast and performances, stunts and practical effects, cinematography, set design, and a smattering of other elements. As an informational piece, “Warfare” seems unremarkable. It tosses out a decent array of facts about the production but lacks much substance. However, it compensates with quite a few good shots from the set. These add zest and make the show more interesting. Next comes the five-minute, 57-second Eagle Eye On Location: Washington DC. It features remarks from Caruso, Kurtzman, co-producer Pete Chiarelli, actor Michael Chiklis and Library of Congress Director of Communications Matt Raymond. As expected, we go to the National’s Capital and check out the segments shot there. It provides a pretty mediocre take on that subject, though we do get some more nice footage from the shoot. Is My Cell Phone Spying On Me? lasts nine minutes, 14 seconds and provides comments from Monaghan, Chiklis, LaBeouf, Kurtzman, Caruso, Chiarelli, University of Wisconsin-Milwaukee Asst. Professor in the School of Information Studies Michael Zimmer, Electronic Privacy Information Center executive director Marc Rotenberg, and producer Edward McDonnell. “Spying” offers a look at the technological aspects of the movie’s plot. It seems superficial but still provides enough facts to give me the creeps. For the final featurette, Shall We Play A Game? fills nine minutes, 22 seconds. It gives us a chat between Caruso and WarGames director John Badham. Essentially they discuss Eagle Eye and its connection to other films, WarGames included. It’s fun to see Caruso with his mentor, and they turn this into a reasonably stimulating conversation. A Gag Reel goes for seven minutes. For the most part, this consists of the standard collection of mistakes and chuckles. It does include a few fun improv moments, though. In addition to the film’s theatrical trailer, we find a Photo Gallery. It offers 40 images that come from the set and from the film. It’s a completely pedestrian collection. If you can tolerate the many stretches of logic in Eagle Eye and just go with the flow, you’ll probably enjoy it. 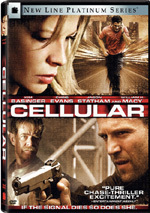 The movie hits snags, but it compensates with an intriguing story and plenty of exciting action pieces. The DVD provides strong picture and audio, and it also throws in a decent but unexceptional collection of supplements. Although the 2-disc set doesn’t dazzle with extras, this is a fun movie and a good release.